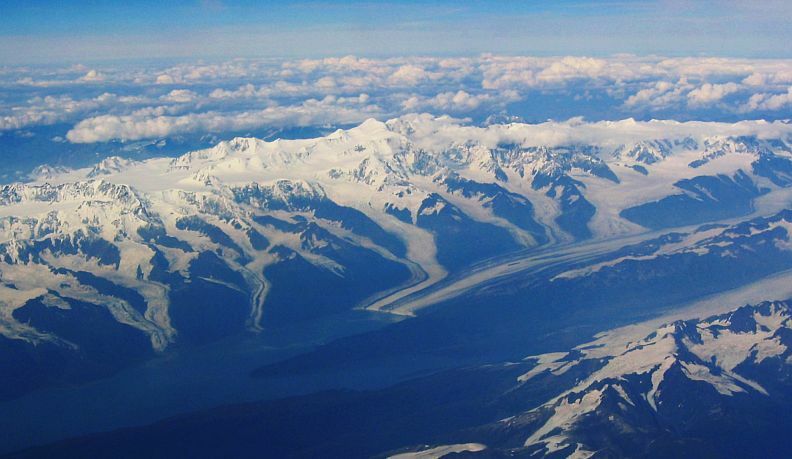 The Alaska Range is the largest mountain chain in Alaska. It curves across south central Alaska for 400 miles, from the Alaska Peninsula to the Yukon Territory. The mountains trap a great deal of moisture moving northwards from the Gulf of Alaska, thus producing tremendous amounts of rain and heavy snowfall. This great amount of precipitation gives rise to many large glaciers, including the Canwell, Castner, Black Rapids, Susitna, Yanert, Muldrow, Eldridge, Ruth, Tokositna, and Kahiltna Glaciers. There are four major rivers that cut through the range — they are the Delta, the Nenana, the Nabesna and Chisana. Large areas of the range are protected in many national parks and preserves, including Wrangell-St. Elias National Park and Preserve, Denali National Park and Preserve, and Lake Clark National Park and Preserve. The Alaska Pipeline runs through parts of the range, parallel to the Richardson Highway. The range was given the name of "Alaska Range" in 1869 by naturalist W. H. Dall. Its highest peak, Mount McKinley (Denali), is the highest point in North America at 20,320 ft (6,194 m.). Denali is one of the seven summits and a very popular, although very harsh, mountain to climb. Its slopes are covered by several hundred large glaciers, and temperatures on the upper slopes never rise above 0° F.